HABIT & HOME: What's for Lunch? 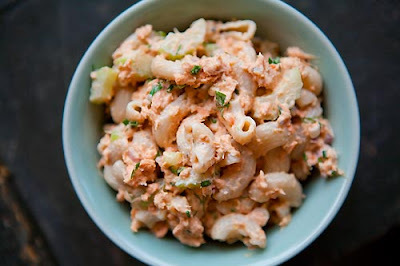 Tip: add the macaroni to the salmon mayo mixture when it is still warm. That way it will absorb the flavors better. 1. Bring a pot of water (2 quarts) to a boil. Add 2 teaspoons salt. Add the dry macaroni pasta and cook, uncovered, in a rolling boil for about 10 minutes, or until the macaroni is al dente (slightly firm). Remove from heat, drain, rinse briefly in cold water (macaroni should be still warm after rinsing) and drain again. 2. In a large bowl mix the salmon, mayonnaise, mustard, lemon zest, and lemon juice. Mix in the shallots, parsley, dill, and celery. 3. Mix in the cooked macaroni while it is still warm. Add Tabasco and freshly ground pepper to taste. Adjust seasonings. Chill before serving. Serves 4. *if any of you try out this recipe, lemme know how it turned out!